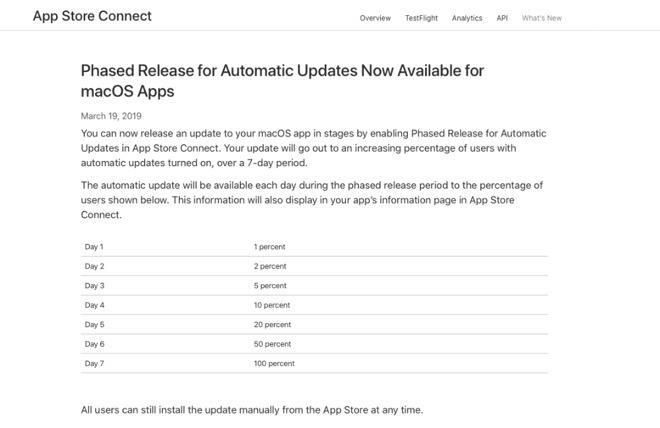 "You can now release an update to your macOS app in stages by enabling Phased Release for Automatic Updates in App Store Connect," says Apple in a notification on its Developer website. "Your update will go out to an increasing percentage of users with automatic updates turned on, over a 7-day period." This affects when an update appears in the Mac App Store's Updates section. If you have Automatic Updates turned on, then the new version will be installed immediately. 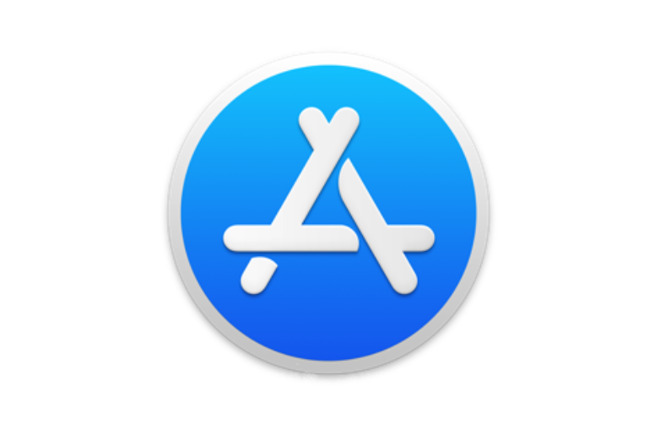 If you do not, the update will add a red badge to the Mac App Store icon alerting you that it's available. This new developer feature means different users will see that badge or have that update automatically installed at different times. Specifically, one percent of users will receive the update on the first day and two percent on the second. It then rises to 5, 10, 20, and 50 percent over the next days until on the seventh day, 100 percent of users will have the update offered. If you know an update has been released, however, you don't have to wait for it. "All users can still install the update manually from the App Store at any time," says Apple's notification. The purpose is to help developers find problems and thereby help us avoid issues. While apps will have been beta tested, it's when they are released to the potentially millions of users worldwide that issues may be found. This way, the developer has a chance to pause the release before a problem can affect everyone. "If you find an issue with your update, you can pause the phased release at any time, for a total of up to 30 days, regardless of the number of pauses," concludes Apple's note. This new feature is for Mac App Store developers, but developers hosting on the iOS App Store have had this option since 2017. Agreed - It must be every developer's nightmare to release an update only to realize that there's a major bug in it and half the user base already has it installed. Very pro-consumer and pro-developer move, Apple. Nice! How about limiting the number of updates per year, and getting developers using TestFlight? It’s really annoying to have hundreds of apps installed that have weekly or bi-weekly updates: dozen of apps each day, resulting in battery drain, unavailable apps or significantly increased mobile data usage. One would think quarterly updates should be sufficient, plus two security updates. So major breaches excepted, six updates per year. For everything else: use TestFlight! This is a bad excuse for accommodating developers releasing insufficiently tested apps.